Background: Since its origin, Green Chemistry has been focusing on the need for eliminating or minimizing the harmful effects of various organic solvents used, on health as well as on the environment. Analytical techniques generally compromise two very important parameters safety and environmental impact. Applying concepts of Green Chemistry and Quality by Design (QbD) solves dual purpose of being environmentally benign and robust in a single method. 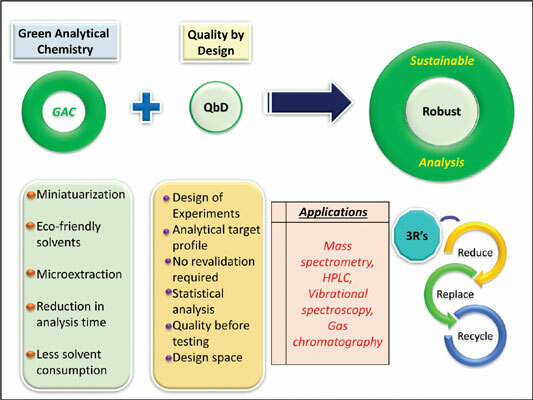 Objective: This review deals with the importance and advantages of using both Green analytical chemistry and QbD in analytical techniques. QbD is an organized and fastidious approach to method development in pharmaceutical analysis. It emphasizes in-depth evaluation and exploring of alternative methods in a systematic way to obtain optimal and best method performance. Method: The three main aspects of Green Analytical Chemistry (GAC) include green sample pretreatment, miniaturization of analytical devices and a reduction in the waste generated and ensuring the use of proper waste treatment methodology used. Criteria to adjudge greenness of analytical techniques include HPLC-EAT tool, AMVI approach and greener solvent selection based on solvent selection guide. Design of Experiments is an important statistical tool of QbD. Conclusion: Novel Combination of both GAC and QbD gives the dual advantage of a robust as well as environmentally benign method. The application of GAC to HPLC and various Bioanalytical techniques has proved to be a suitable approach giving additional economic benefits as well. But still a lot remains to be done and explored in this regard. QbD is the need of the future due to imparting in-built robustness to the process or method and ensuring the quality beforehand rather than after the product is obtained. Green Chemistry, Green analytical chemistry, Quality by Design, HPLC-EAT, AMVI, organic solvents.